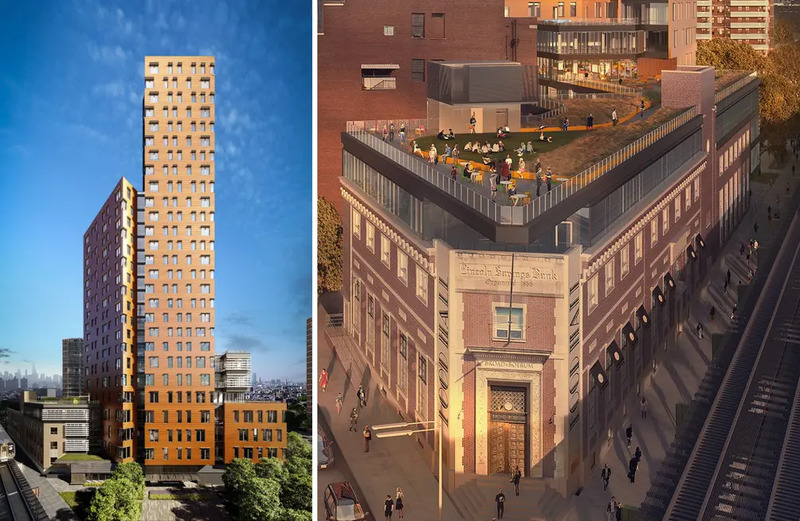 Here's your first look at a large mixed-use rental development planned for 525-545 Broadway in East Williamsburg. Images posted on the website of developer Blesso Properties and Bravo Builders show a contemporary tower of punch-out windows fronted by a rehabilitated Lincoln Savings Bank building on Broadway. Blesso Properties purchased the triangular site bounded by Broadway, Boerum and Lorimer streets for $33 million back in August 2016 (TRD). 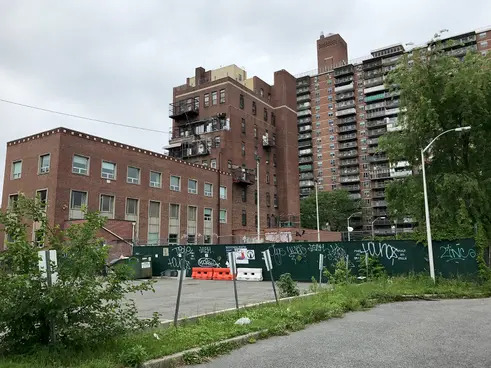 Earlier plans filed in 2015 called for a 10-story, 36-unit building, but revised permits detail a much larger project — one that will be the tallest in East Williamsburg and Bushwick. 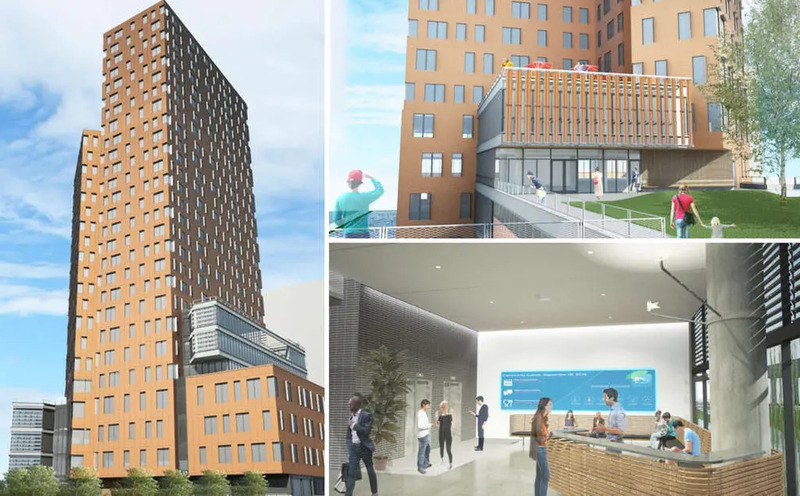 The proposed 27-story, 298-foot-tall structure will hold offices along lower floors and 218 rentals above, according to submitted floor schedule. 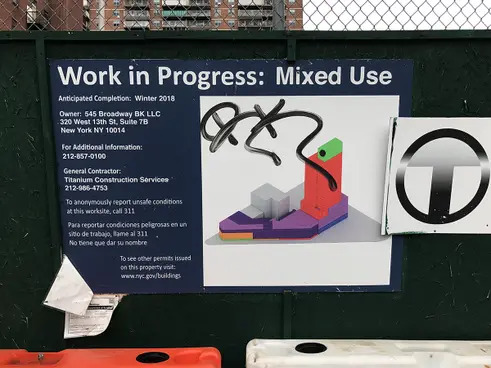 Per a program rendering posted on the site's construction fence, the tower will rise closer to Lorimer Street away from the ruckus of the overhead J and M train lines. Garrison Architects are listed as the architect of record. The tower will be clad in orange-colored panels that somewhat complements the brick of Lincoln Savings Bank buildings. 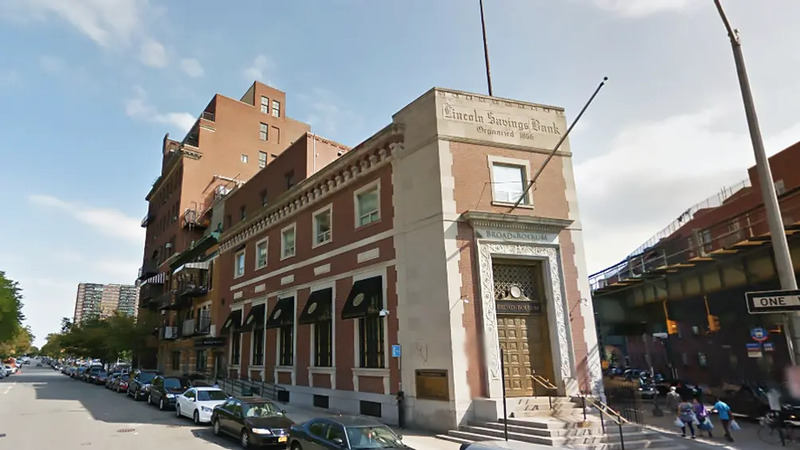 Many wondered if the bank building would be saved but it seems like the development team is committed to keeping it and will build a modern addition and roof deck above it. Renderings show the banking hall will be converted into a food hall. 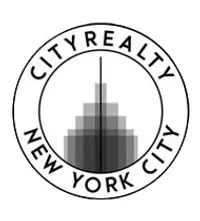 Apartments will start on the seventh floor and many units will have beautiful views of the Manhattan skyline. 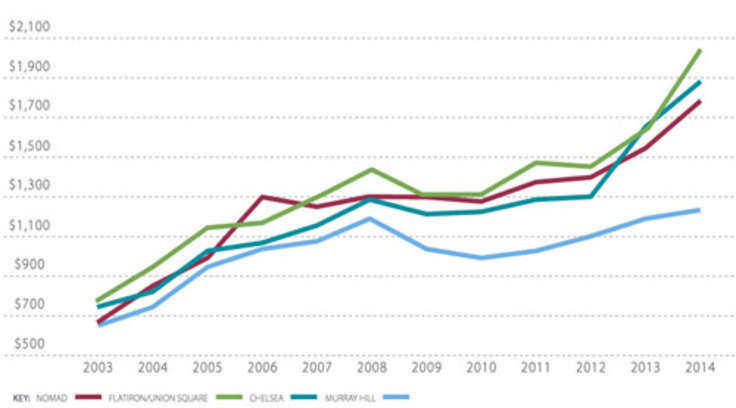 Amenities are to include parking, many common and private residential terraces, a fitness center and a roof deck. Blesson says there will be more than 80 SF of open space per resident and go on to say, "All amenities have been designed and curated to holistically foster community interaction, support health, and well-being, cultivate sustainable living practices, as well as play host to a broad range of site-specific, programming created to bring residents, visitors together to live, work and play."